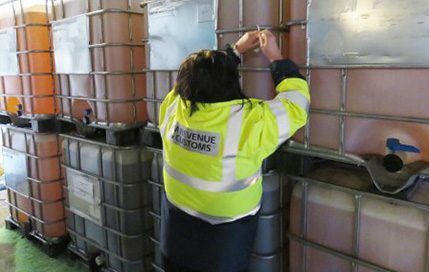 Earlier this month, eight men were arrested and 55,000 litres of fuel seized, as part of an ongoing HMRC investigation into a suspected fuel smuggling fraud worth an estimated £3 million in evaded tax. HMRC officers searched one business and four domestic addresses in Knowsley, Liverpool, Manchester and St Helens. Simultaneously, in Northern Ireland HMRC and officers from the Police Service of Northern Ireland carried out searches of six domestic addresses in counties Antrim, Armagh and Down. Storage tanks, equipment, 55,000 litres of fuel, a quantity of cash, computers, business records, a lorry and a trailer were seized during the operation. Seven men have been released on bail and investigations continue. “Fuel fraud costs millions of pounds in lost duty every year, meaning the public lose out on vital funds for essential services, and it creates an uneven playing field for honest businesses,” said Sandra Smith, assistant director, Fraud Investigation Service, HMRC. A West Midlands gang, who evaded more than £900,000 in duty and taxes by running a huckster site, an illegal filling station, has been sentenced. Frank Daly, 54, his son Jacob O’Callaghan, 26, and Danny Williams, 22, all from Wolverhampton, were arrested when HMRC investigations revealed the three had purchased more than 1.2 million litres of kerosene, which they were selling to motorists as road diesel. The three men were operating from an industrial unit in Willenhall between 2009 and 2014. The men received sentences ranging from six months to five and a half years.